Just the two of us again today, myself and my son Dean. With reports of fish showing in and around the Norwich city centre, our usual swims are getting lots of pressure and attention so we both decide a change of scenery is in order. We load the boat with the usual car load of tackle, food and kitchen sinks and turn Left out of the marina towards Surlingham and Brundall. It already feels much milder than of late and the forecast is for bright, sunny weather later in the day, Not really ideal conditions for Pike fishing.Its difficult to work out where to start on this part of the Yare as so many spots look "fishy". We eventually settle on a reeded bank just downstream of the Surlingham ferry pub and soon have one dead and one live bait out each of our two rods. The depth is a fairly even Twelve foot along this bank and the flow and colour look ok too. We both have different baits on each of our rods but after ninety minutes, not so much as a sniff on anything. We then decide to move further downstream and pop into the broad to see if that's worth trying too. 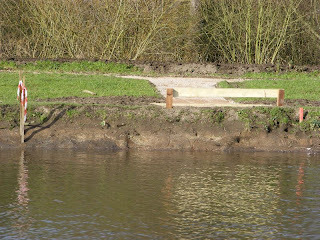 Again we choose a fishy looking corner with sunken trees, weed and reed beds. Its now almost 9:30am and the sun is getting brighter and warmer by the minute. Various layers of clothing are soon filling the cuddy of the boat, but still our baits are being completely ignored. Maybe this "Spring" weather has fooled the Pike into other things rather than feeding. By 10:30am the only thing we look like catching is, the sun. We carry on ringing the changes for another half hour but nothing materialises so a final move back towards the marina is on the cards. The area we decide may throw up a fish or two is the outfall close to the A47 bridge. The water here always has a bit more movement and flow due to the outfall discharging into the river. On route back, we pass the newly constructed fishing stagings on the Surlingham bends. For weeks there have just been various pegs and markers on the bank. 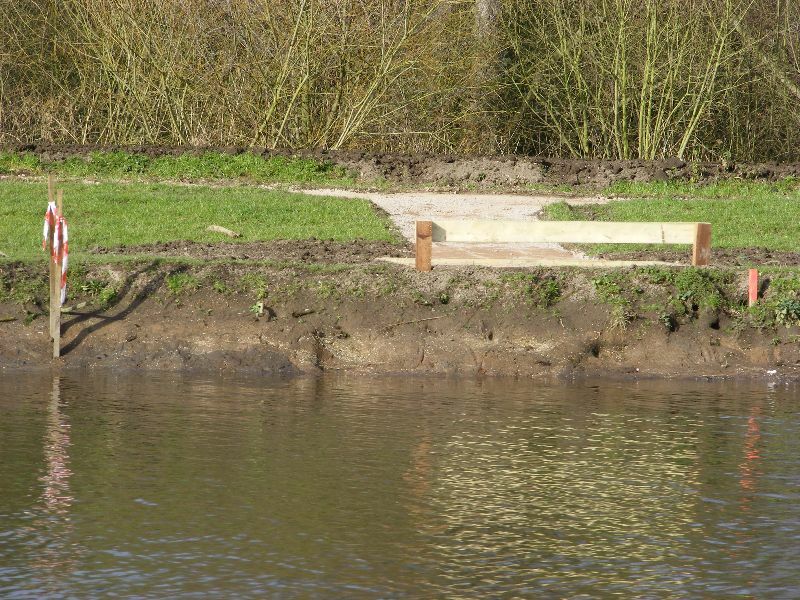 Today they are well and truly taking shape and should provide easy access and comfortable fishing when completed. We moor up just short of the foaming water pouring from the outfall and quickly get our Four baits back into the water. This swim is normally a banker for at least One fish and has saved many a blank day in the past. Another Ninety minutes quickly passes and still we cannot muster a single take between us so reluctantly we decide to call it a day and head back onto the mooring. Dean is still eager to get a bait in the water as i start to unload most of the unwanted gear back into the car. I give him a Ten minute deadline to pack up. Almost instantly his float fished Perch is taken, the float moves away and Dean tightens up only to pull out on the strike. That just about sums up the day and he then packs his rods away having to suffer his first ever "Blank" since starting Pike fishing last October. 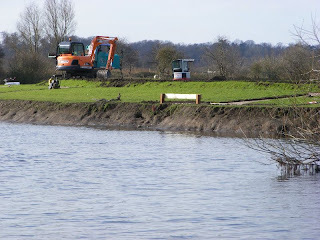 We drive home in T shirts and sunglasses whereas Ten days ago the boat dyke was frozen solid !! !